I've gotta brand new bag! I love my new little purse. I made this purse using Bananafana's latest pattern, My Pennie Purse and two different fabrics from Moda's Wonderland collection by MoMo which will be available March 2009. Check here for all the latest fabric collections coming out for Moda. 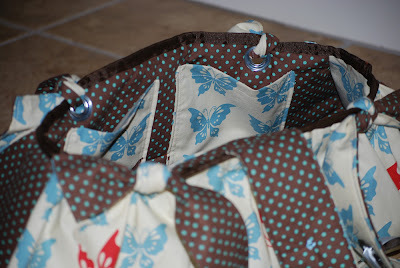 You have to make this bag.... or two, or three! 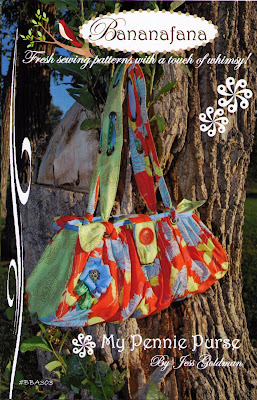 It is just so much fun... and the fabric possiblities are endless! I know what you mean about Jess' patterns, (I live not too far from her in the next little city) she is amazing and so is your purse! Your ribbon rose is darling! Thanks for sharing! I am having a really hard time finding this fabric. Can you help me with where I can find it. sorry, kiddos were distracting me...it looks like it is not available yet...is that correct...if not can you tell me when it will be available and where the best place to get it is. I have seen several cute projects that use this. Your purse is darling...Thank you so much! The Wonderland fabric collection will be in stores in March 2009. You can find a store near you that carries Moda Fabrics by using our Where To Buy Store locator or you can find a store online by searching for Moda Wonderland. Thanks so much! Wow! 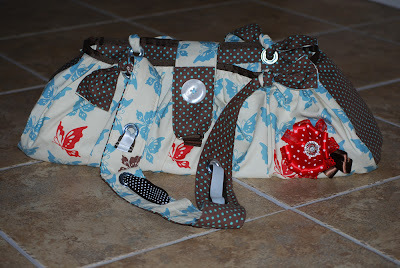 Great purse and I love the fabric! Can't wait to get my hands on it in March! great bag! and wonderful fabrics too! My teenage daughters would LOVE this bag and fabrics. glad it was fun to make. Your bag turned out stinkin' adorable! 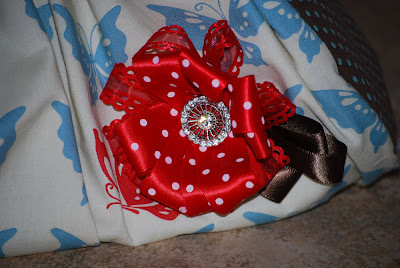 I LOVE that fabric, it would be so cute in the lipstick skirt, I think I'll have to do that for market. Thanks for making it and posting it on your blog! Take care! I love your bag!!! I want to steal it... just kidding, but it is super cute and so trendy. I wish I had your talent! All of our love.